The guest lecturer for 2018 will be Charles Dowding. Charles is an acclaimed innovator of no dig, organic growing since 1983 and his original weed free methods give superb results in both small and large areas. 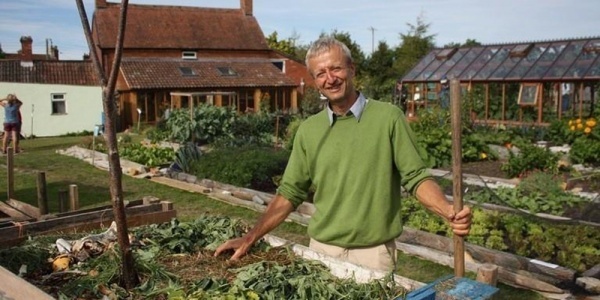 He sells produce from his bio-intensive, no dig, garden, has written nine books, writes for national and international magazines, runs a youtube channel, appears on TV and radio and teaches extensively at home and abroad. Charles will give an illustrated one hour talk on how to have healthy soil and enjoy easier harvests, followed by a question and answer session. He explains how he makes, buys and uses compost and mulches of different kinds to initially clear perennial weeds such as couch grass and bindweed, and then maintains the plot with an annual mulch. The lecture will be on Wednesday 25th April at 7pm at the Minster School in Southwell. Tickets cost £7.50 and include a glass of wine or soft drink on arrival. They are available from The Cathedral Shop, A J Beckett Electrical in Southwell, and www.eventbrite.co.uk. Charles will be bringing a selection of his books, signed and ready for sale.